Your partner or spouse may have told you that your snoring keeps them awake at night. Lack of sleep can cause anger, frustration, and discord in your relationship. Sleep deprivation can affect performance, the ability to think clearly, and leads to irritability and increased anxiety. You may have no energy or may wake up with a headache. You may try to fit in a nap anytime and anywhere you can. If your doctor diagnoses you with sleep apnea, you may need to start using a CPAP machine at night. For many people, the first night using a continuous positive airway pressure (CPAP) machine can be intimidating. However, a CPAP machine gives you the potential for better sleep. You can look forward to waking up refreshed, which is something you and your spouse may have been missing out on for many years. To get started, you should choose a spot in your bedroom for your CPAP machine. Many people put it on their nightstand or the floor next to their bed. It should be close enough to your bed to allow the tubing to reach your face comfortably and near an outlet. After you choose a spot, fill the machine’s humidifier tank with water. The machine is now ready to be used. To make sure that your CPAP machine stays sanitary, you should clean it often to remove allergens, bacteria, and mold. This way, you can focus on getting a full night of sleep rather than being worried about unhealthy germs that may reside in your machine’s tubes and mask. 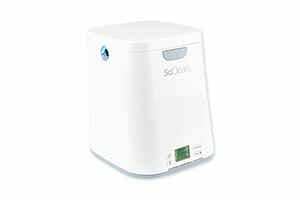 Rather than dealing with the hassle of manually cleaning the inside and outside of a CPAP machine’s tubes, mask, and humidifier, many people purchase a CPAP sanitizing machine, such as VirtuCLEAN or SoClean. 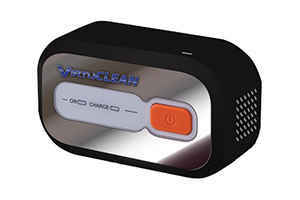 VirtuCLEAN kills 99% of mold, bacteria, and viruses that can hide in your CPAP machine, tubing, and mask. The VirtuCLEAN CPAP Cleaner uses Ozone, or “activated oxygen,” to kill harmful germs and bacteria. It fully cleans your machine without the use of water or chemicals. When you wake up, you simply connect your machine’s hose to VirtuCLEAN and turn it on. After 30 minutes, the cleaning cycle is finished. After a 5-minute “flush” cycle, the machine shuts itself off. The VirtuCLEAN is compact and easy to operate, taking up little space on a nightstand. Plus, it runs on a rechargeable lithium-ion battery with a 10-year life. Every charge gives seven full cleaning cycles before recharging by USB is needed. Plus, the VirtuCLEAN filters do not need to be changed, making maintenance almost non-existent. SoClean is another easy and fast way to clean CPAP machines effectively. It is compatible with many CPAP models, and it also kills 99.9% of mold, bacteria, and viruses using Ozone, or natural activated oxygen. Like VirtuCLEAN, SoClean cleans the machine’s mask, hose, and the reservoir without the use of water. Since just a single drop of water left in CPAP equipment can create mold and bacteria, a CPAP cleaner that thoroughly dries your equipment is essential. 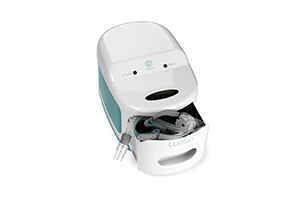 When the SoClean finishes its 10-minute cleaning cycle, your CPAP machine is ready for use.